Sorry for the lack of reports but things really have been busy here again on the rivers which is great for me and I am just about to take a few good days off. I have fished everywhere this week from the Whiranaki to some small rivers under the mountain and experienced some fantastic fishing which could be classed as world class. Backcountry fish have been rewarding for the angler this week with most still looking to the surface despite Cicada’s having died down. 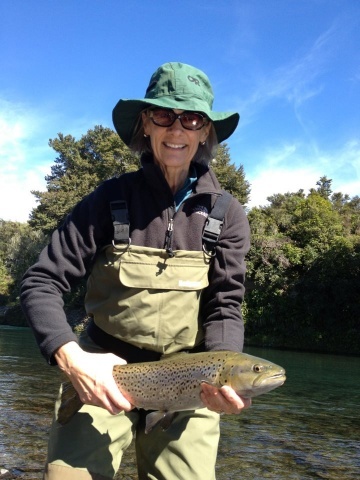 Trout have been been looking up for weeks and weeks now and will continue while we have good weather with warmer conditions especially while fishing low water levels are low. 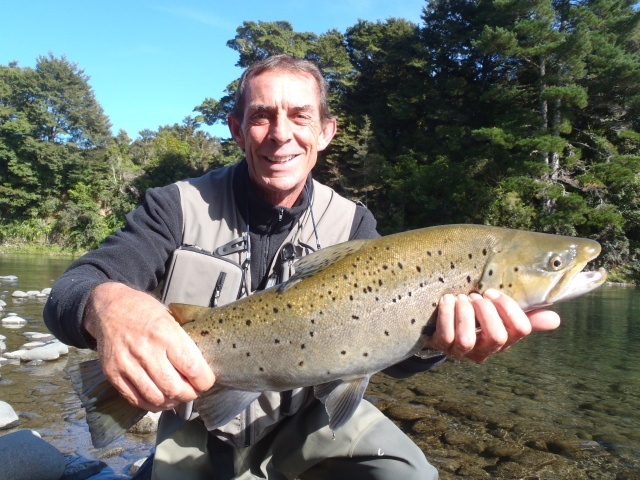 Condition of trout this summer has been very good and this late in the summer they have had plenty of time to fattern nicely and put on weight for the coming winter. Some of the more mature hen fish have even started to cycle small eggs from the look of their plump stomochs this could beÂ a sign of happy fish with plenty of food.Â I have had some skillful clientsÂ this summer and withÂ the dry fly being so good in the backcountry and on the Tongariro it will be shame to see winter arrive and winter methods applied to catch spawning fish, it has been a rewarding few months. 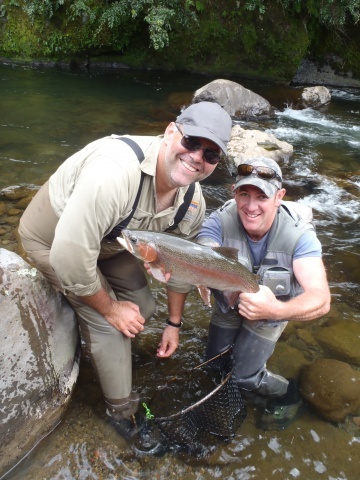 The Tongariro has been patchy but some good fish can still be caught if you keep moving around and fish as many pools as you can in the day. Some big browns continue to turn up in most anglers catch bags along with the odd silverÂ rainbow which could be classed as a early spawner. 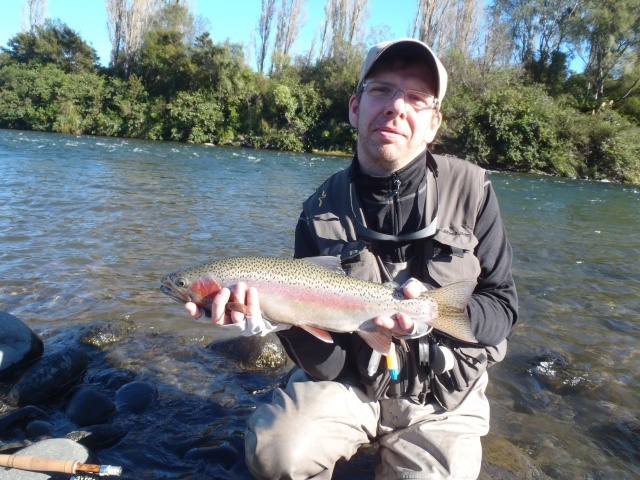 We are due some rain in the next few days which will no doubt move up some more browns and push others high in the river but it is very hard to say weather it will bring the first rainbows of the season into the system. Fish have still been looking up while conditions are right with good numbers of recovering smaller rainbows still willing to grab the dry fly from the shallower runs. 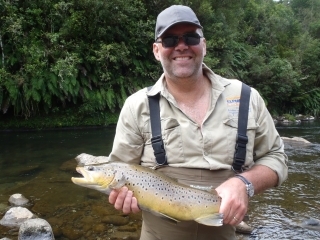 I have again been out targetting brownsÂ while on the Tongariro this week but have found them slightly harder to get to take with only a few good fish to display. Cattle Rustlers again has been the area which seems to come up trumps for me simply as they seem to hang out in here over the last couple of years and youÂ can cast at more fish in a short period. Many anglers walk past these fish or push through this water too fast spooking potential troutÂ but thisÂ is where they are being caught. As you will see from one of the pictures the old man is here for another 6 weeks and had taken advantage of a free guiding service (nothings ever free Dad)Â Â and managed to rise a nice brown to a Turk’s Tarantula, a good first fish for the holiday. 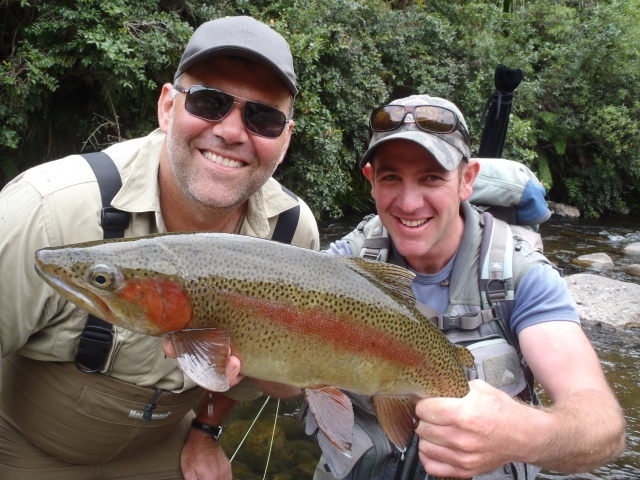 The Delta has fished really really well over the last few weeks and some of the fish that have been getting taken are superb specimens with orange flesh and thick sides. They have had a good year in the lake and found the food needed to put on weight and condition. These fish will end up in the rivers to spawn the key will be to have the right skill level and being able to read the right water to catch them at the right time, this does not mean under the main road bridge!. Anyway have a goodÂ week at work and hope you enjoyÂ a few of the pictures gathered over the past week, certainly some happy memorable moments.